Your country setting affects location-aware applications, physical sensors, and in some cases also affects currency, date, and number formatting based on your regional settings. When you travel, you can change your time zone to match the local time - there's no need to change your actual country. (Or you can keep your current time, but add multiple clocks in the tray.) 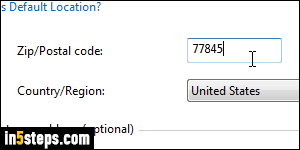 I'll show you how to change country and default location in Windows 7. 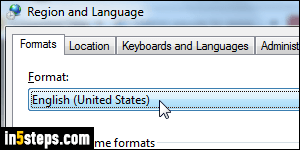 Later tutorials will go into changing Windows language, using foreign language keyboard, etc. 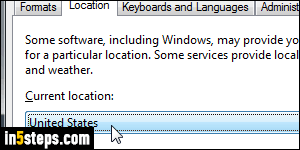 Open the start menu and type "location" in the search field. Then, click on the "Change location" link result under Control Panel. 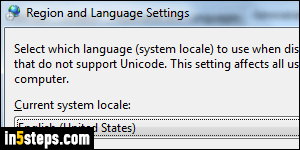 This will open the Region and Language popup, with the Location tab preselected. Changing your country here affects Windows 7 and third-party desktop applications that rely on your physical location to tailor their content. Most often, web apps (online programs that run inside a web browser), determine your location by relying on your "IP address" (unique number you're automatically assigned whenever you connect to the web), so web apps won't be affected by this location setting. Optionally pick a different country from this dropdown. Now click on the Default location link at the bottom of the tab to open the Location and Other Sensors page in the Control Panel. Enter your default zip / postal code in the text field, and pick your default country / region from the dropdown; you can even enter your default physical address. 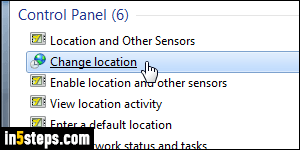 Tip: based on the sensors connected to your PC, you can access a geo-tracking log by typing "location" in the start menu, and clicking on the View location activity link. Click Apply to save (default UAC settings require an administrator's password for that), and close the window. Back in Region and Language, select the Formats tab: that's where I tweaked Windows 7 to show military time, for example. Regardless of your actual current location, you can format numbers and dates to any region's standard. Picking a different country from the top dropdown restores that country's formatting conventions. Click OK to save.